Day 1: Fly to Washington, DC. On arrival make your way to your centrally situated hotel. 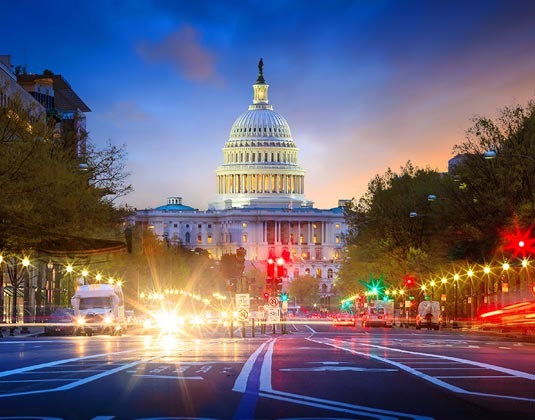 Day 2 Washington, DC: Perhaps begin your explorations on the National Mall to see the Washington Monument, the Lincoln Memorial, the beautiful Jefferson Memorial, the moving Vietnam War Veterans Memorial and the Korean War Veterans Memorial. Rising up from the Mall is the US Capitol Building, while nearby is the Library of Congress. For a window into America's most famous house, head to the White House Visitor Centre. Day 3 Washington, DC: No visit to Washington, DC would be complete without taking in some of the magnificent Smithsonian Institution. Founded in 1846, it's the world's largest museum, education and research complex, consisting of 19 museums and galleries, the National Zoological Park and nine research facilities. Equally impressive is the United States Holocaust Memorial Museum, or Newseum, which highlights 500 years of news history. Day 4 Washington, DC/Philadelphia: Make your way to Union Station and catch the Amtrak train north to Philadelphia, regarded as the birthplace of American democracy. On arrival, make your way to your hotel. Day 5 Philadelphia: One of America's most beautiful cities, Philadelphia merges the buzz of a big city with the charm of a small town. There's probably no better starting point than the historical square mile of cobbled-streets that incorporate Independence National Historical Park. Here you'll find Independence Hall and the Liberty Bell. Also not to be missed is Philadelphia's City Hall, Rittenhouse Square and Society Hill Historic District. Day 6 Philadelphia: Perhaps head to the Benjamin Franklin Parkway which boasts some of the city's most acclaimed museums, including the Philadelphia Museum of Art. This museum is also the location of the Rocky Statue and the Rocky Steps - better known as the Art Museum steps. Making an iconic trip up the steps is regarded as a rite of passage, particularly for first time visitors. Day 7 Philadelphia/New York City: Return to the station and travel onwards by Amtrak to New York City. Sit back and relax for around 1½ hours until the Manhattan skyline comes into view. On arrival make your way to your hotel. Day 8 New York City: Where better to take in the grandeur of the city than from an observation deck, be it the Empire State Building, Top of the Rock or One World Trade Centre. Alternatively, book a helicopter tour for a real bird's eye view of New York. Other options include taking a stroll across Brooklyn Bridge or catching a ferry to Liberty Island to see the iconic Statue of Liberty close up. This evening, why not take in a Broadway show. Day 9 New York City: Other recommended sights include Central Park, Fifth Avenue, Times Square, Radio City Music Hall, a wealth of museums and Greenwich Village. Day 10 New York City: Time for last minute sightseeing or shopping before making your way to the airport for your onward journey. Accommodation: 3*Plus Washington Hilton; 3*Plus Wyndham Historic District, Philadelphia; 3* Wellington, New York City. Tour price: The price shown is based on the best value travel dates in low season and includes international flights to Washington, DC and return from New York, Amtrak rail travel from Washington, DC to Philadelphia and Philadelphia to New York, and accommodation as stated.